In Kim Marriott, Falk Schreiber et al. (eds. ): Immersive Analytics, Springer International Publishing, pp. 289-330. Life and health sciences are key application areas for immersive analytics. This spans a broad range including medicine (e.g., investigations in tumour boards), pharmacology (e.g., research of adverse drug reactions), biology (e.g., immersive virtual cells) and ecology (e.g., analytics of animal behaviour). 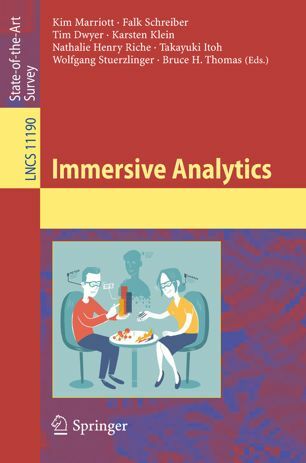 We present a brief overview of general applications of immersive analytics in the life and health sciences, and present a number of applications in detail, such as immersive analytics in structural biology, in medical image analytics, in neurosciences, in epidemiology, in biological network analysis and for virtual cells.